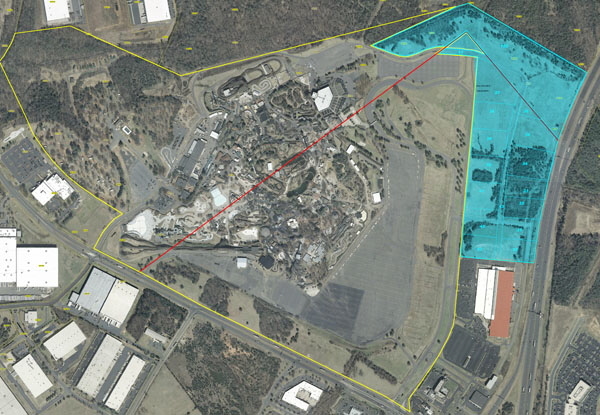 Cedar Fair has announced the purchase of 61 acres adjacent to Carowinds parking lot, which will “enable the Company to achieve future development and expansion of the facility.” For anyone familiar with the Carowinds area, according to the Charlotte Observer, the land is located between the season pass parking lot and I-77. There are a long list of possibilities for the land, from the obvious, park expansion, to hotels, additional campgrounds, or parking. Due to the lands location, largely cut off from the park by the parking lot, it seems like a resort hotel would be the most realistic. But, its a definitely possibility the land could be used to relocate the parking lot to allow for new rides and other park expansion. Anything is rumors at this point, but this is certainly exciting news for any fan. The obvious answer to this Riddle is another Windseeker, a giant swing ride which have been popping up all over the Cedar Fair chain, despite the markings which have been seen in the park labeled “HUSS GF” which of course points to a giant frisbee. Anything is possible and we definitely can’t wait for the announcement on August 24th! What do you think about the large land purchase? What could it be used for? What about the 2012? Windseeker? Giant Frisbee? Leave your comments and Park Thoughts below! Why not use part of the land for a camp site like Fort Wilderness in Disney World? You do realize Carowinds already has a campground? I think Carowinds is getting Dinasaurs Alive for 2013. What do yall think? It’s tough to say. While enthusiasts have been rolling their heads over this, it’s actually a really good thing for the parks. As long as they have it up, they’ll make money. Of course they’ll need to pay it off first, but that should only take one or two seasons to do so. If they leave it up for 5-10 seasons that will bring in a nice sum of extra cash to invest in large attractions. It’s really Matt’s call. If he thinks they’re good for the company, he’ll keep them alive (no pun intended) and build more.